Valhalla, NY, February 2, 2010 - FUJIFILM North America Corporation today announced two new additions to its S-Series line: The FinePix S1800 and FinePix S2550HD. Sporting a 12-MegaPixel 1/2.3" CCD, a powerful Fujinon 18x Wide-Angle optical zoom (28mm-504mm equivalent) and an extra large 3.0" High-Contrast LCD and electronic viewfinder, the FinePix S1800 and S2550HD are perfect for advanced amateur photographers who want an affordable, step-up digital camera that will still fit in the palm of their hand. While both digital cameras have the ability to capture movies in HD quality -720p HD - the S2550HD also has a mini HDMI Port for quick and easy connection to their home theater system. Both the S1800 and S2550HD can also use Fujifilm's optional HD Player Kit - which includes an HD Card Reader that connects to your HDTV via HDMI Cable for true digital transfer of HD quality and a wireless Remote Control for video playback from the comfort of your couch - and you maximize your HD experience. "With the rapidly increasing adoption of HDTV, consumers have changed how they use their digital photographs and movies," said David Troy, marketing manager, Consumer Digital Cameras, Electronic Imaging Division, Fujifilm North America Corporation. 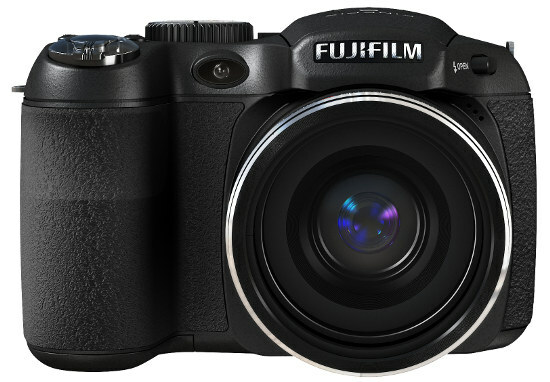 "Fujifilm's superior image quality with the FinePix S1800 and FinePix S2550HD enables the user to capture still images and shoot video in true HD and realize the benefit of superior image quality and long zoom capabilities with their home entertainment system." In addition to Fujifilm's signature Face Detection, Fujifilm has added two fun and valuable features: Smile Detection recognizes the precise moment your subject smiles and releases the shutter only when this happens; and Blink Detection warns you if any of your subjects have blinked so that you can re-take the photo if necessary. Fujifilm has created a new Picture Search tool which allows you to find photos quickly and easily. You can search with both digital cameras by whichever Scene Mode the photo was taken. For instance if you select 'Portrait,' you can view all photos shot in Portrait mode, or 'Macro' to see all close up shots...etc. It's a time saving feature which means that you will no longer have to waste time searching through all your photos to find the ones you are looking for. 3.0" High-Contrast LCD and Electronic View Finder: The FinePix S1800 and S2550HD are fitted with a high contrast 230K-pixel 3.0" LCD and Electronic View Finder. The high contrast LCD is a considerable benefit in bright light and means that the camera can be pitched at various shooting angles to enable framing of awkward shots, while the Electronic View Finder provides even more flexibility for the user. Dual Image Stabilization: Long-zoom cameras need stabilization more than any other compact, with handshake and subject movement a particular problem in low light at telephoto range. The FinePix S1800 and S2550HD reduce blur to a minimum with a mechanically stabilized CCD sensor and high ISO sensitivity (to ISO 6400), so that blur is reduced to an absolute minimum. 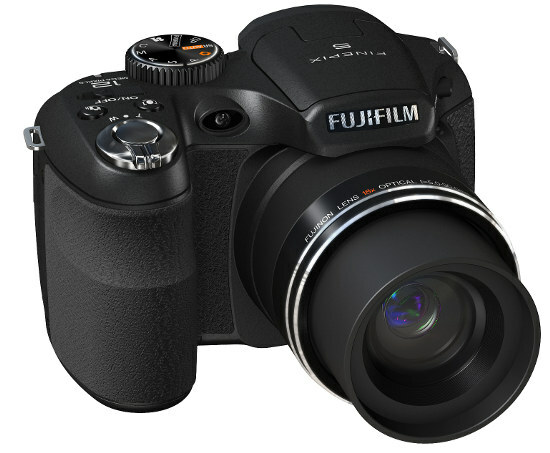 Face Detection and Automatic Red-eye Removal: To provide perfectly exposed and focused portrait shots, the FinePix S1800 and S2550HD are both fitted with Fujifilm's latest Face Detection technology which is able to track up to 10 faces simultaneously, at almost any angle to the camera. The system instantly corrects red-eye and then saves both the original and the corrected image file automatically. The FinePix S1800 is available in late January 2010 at a retail price of $229.95, and the FinePix S2550HD will be available in February 2010 at a retail price of $249.95. FUJIFILM North America Corporation, a marketing subsidiary of FUJIFILM Corporation, consists of five operating divisions. Imaging sells consumer and commercial photographic products and services including film, one-time-use cameras, online photo services and fulfillment, digital printing equipment and service. Electronic Imaging markets consumer digital cameras. Graphic Systems supplies products and services to the printing industry. Motion Picture provides motion picture film. The Canada Division (operating as FUJIFILM Canada Inc.) markets the range of FUJIFILM products and services. For more information, please visit www.fujifilm.com/northamerica , or go to www.twitter.com/fujifilmus to follow Fujifilm on Twitter. To receive news and information direct from Fujifilm via RSS, subscribe at www.fujifilmusa.com/rss.